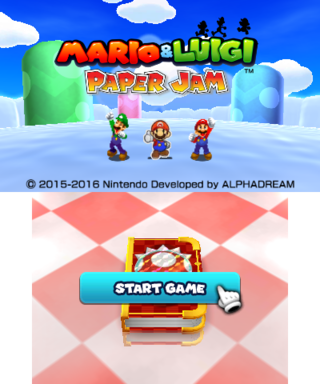 Mario & Luigi: Paper Jam is the result of a not-so-unexpected blunder by Luigi, where a book containing the world of Paper Mario (featuring Paper Mario) is knocked loose from a shelf and the world inside is unleashed upon the Mario & Luigi universe. 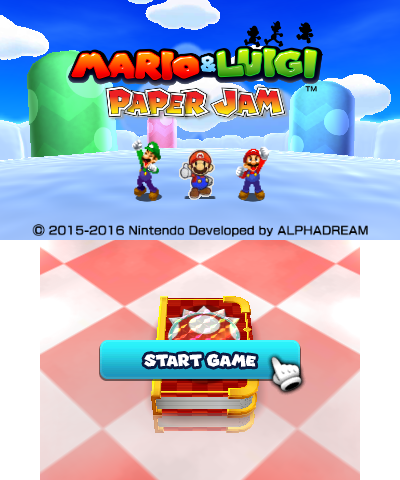 This crossover focuses on adding Paper Mario (and paper enemies) to the typical Mario & Luigi formula, but also features new(ish) gimmicks such as Papercraft Battles and cards that assist the player in battle. For the bugs namespace: There are lots of glitches, including one that displays Japanese text in non-Japanese copies of the game. Two checkerboard textures named Test_01 and Test_02 can be found in m_title. Note that Test_02 (the red and white checkerboard texture) is almost the same as the one on the title screen. 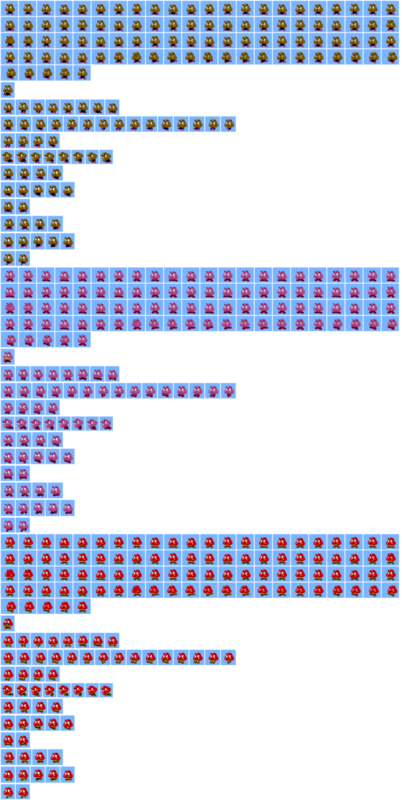 A hand sprite is present in pmd_dmg_test. A darker paper Goomba was left in bm_p_dummy00, bm_p_dummy01, and bm_p_dummy02. A debug font can still be found in h3d.bch. This same font is also present in Super Mario Maker. ...But what does it mean? This game has text or audio that needs to be translated. If you are fluent with this language, please read our translation guidelines and then submit a translation! This scene is under production. Win in battle by pressing the L + X buttons. Are you sure you want to go to easy mode? stronger to help defeat the monsters. The easy mode button has appeared in the lower screen! After this, you go underground in Twinsy Tropics on the way to Bowser's Castle. Twinsy Tropics is still in development. Set the Fire Gem as collected? Bowser's riding a Papercraft Bill Blaster. He fires a Papercraft Bullet Bill. Mario and the others struggle to escape. removes the Papercraft Bullet Bill. "Mario! I finished the best papercraft!" Hey! Get out that best papercraft"
The two also head into the papercraft. Was able to help the Toads! They got into that area? No! It is fine weather today. 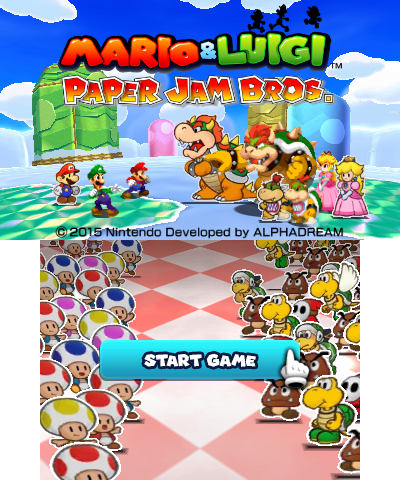 The Europe and Australia version adds Bros. in the Paper Jam title. This page was last modified on 23 May 2018, at 13:42.